Challenge: Create 15 perfectly shaped pieces of pottery from one large lump of clay. You have 15 minutes. For Vicente Hernandez, the man with magic hands, it’s no problem! I recently visited the workshop of this amazing potter, who demonstrated the process from mixing the clay through creating various styles of beautiful and useful clay items. The “mud” originates in the state of Oaxaca, and Vicente began by explaining how he cleans the clay by washing it in large barrels, strains it to remove debris, and dries it in the sun until it contains the proper amount of moisture. He chose a large chunk of clay and kneaded it on a stone table, making it look as easy as kneading bread. He offered a try to our group, and several brave ladies found that they could barely manipulate the clay! Vicente plopped the clay on his kick wheel, and as the wheel began spinning, he instantly formed a tower. Before you could say, “I’d like to see you make a bowl,” he had completed the first one! After shaping each piece and removing it from the tower, he asked the group what they wanted him to make next, and in this manner he worked down to the bottom of the clay tower. Extremely efficient and fast! At age 9 Vicente began to learn the craft of pottery making and said it took about five years of practice to become proficient. For 25 years he worked in a factory, churning out 1000 pieces in a 12 hour day and being paid a few centavos per piece. In 1998 he and his family decided to form their own company, Tierra Quemada, ceramica contemporanea, and Vicente was free to let his creativity shine. What a Pleasure to Drink from these Cups! You can buy (and we did!) Vicente’s wonderful ceramica at the family’s gift shop located at Labastida No. 115, Oaxaca, Oaxaca. Twenty years of searching for pottery in villages of Oaxaca, some of which were so remote they were not even on maps, has resulted in an enormous collection of traditional styles of pots. Eric Mindling created a wonderful exhibit of samples from his collection that visitors can enjoy at the Centro de Artes San Agustín (CASA) in San Agustín Etla. 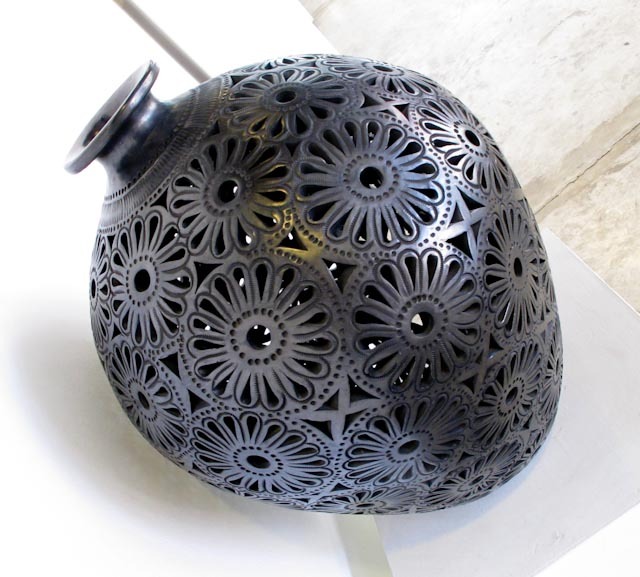 The pieces represent 36 styles of pottery from 60 villages of Oaxaca. Styles changed from region to region, as did the methods for creating them. Eric stated that many of the styles were passed down through families from generation to generation, and it’s possible that the first family member to make a particular style lived 3700 years ago! 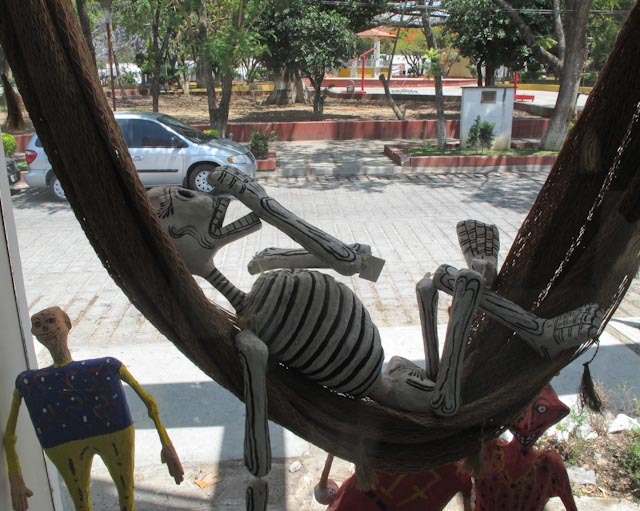 Many styles have been in continual production in Oaxaca for 400 years. During his many years of traveling deep into the mountains of Oaxaca, learning about the people’s lives and the history and use of their products, Eric developed a deep admiration for the skilled artisans who created simple yet beautiful and utilitarian pottery. 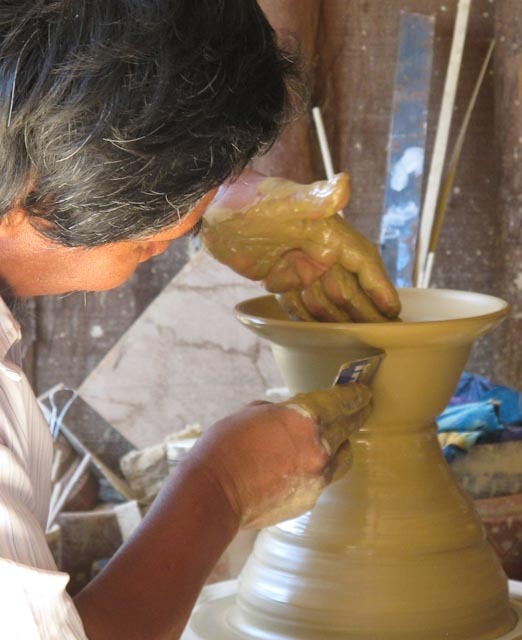 Eric’s book, “Barro y fuego, El arte de la alfarería de Oaxaca,” (Spanish only at this time) tells the story of Oaxacan potters. Even if you don’t read Spanish, the superb photography depicts all the processes and artisans at work. 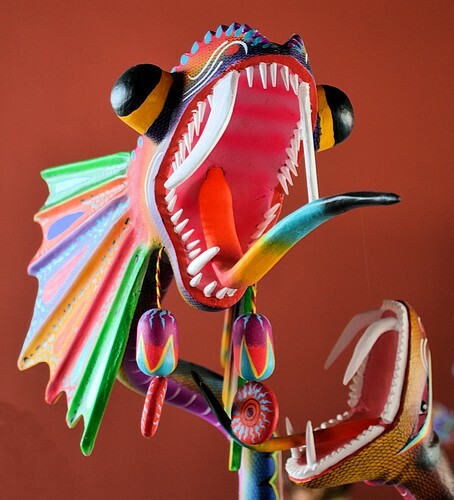 “Oaxaca has a rich heritage that has been unappreciated for centuries and deserves to be recognized. 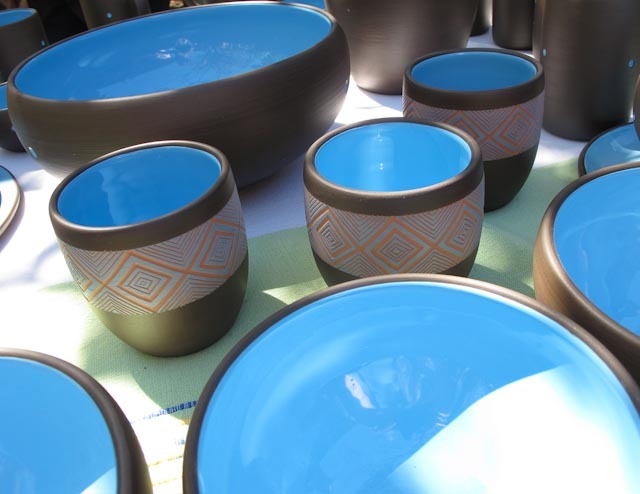 It’s time to celebrate this pottery and learn the wisdom of the artisans.” Eric Mindling. I wonder about the date and use!!! Note: I first met Eric when on a tour with his company, “Traditions Mexico.” During the tour (Fiber Arts of the Oaxacan Coast) we traveled to several villages where rural folk artisans of indigenous Oaxaca and Guerrero live and produce their extraordinary weavings. Eric’s great respect for the people and the excellent rapport he has established with them creates an easy-going atmosphere where villagers and visitors feel comfortable sharing their lives. Check out traditionsmexico.com.